In light of the recent surge in media coverage around soring of Tennessee Walking Horses, two of the largest veterinary organizations in America have released an official statement calling for new measures to help eliminate the practice. The American Association of Equine Practitioners (AAEP) and American Veterinary Medical Association (AVMA) support banning action devices and extreme shoeing practices in the show ring. Specifically, the AAEP and AVMA are calling for an end to chains worn around the front pasterns and performance package shoeing, which consist of stacked pads between the hoof and the shoe. While these practices are currently legal and may not be inherently cruel on their own, their use allows the illegal and cruel practice of soring to continue. 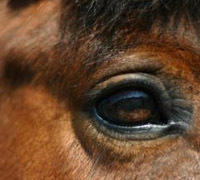 Soring involves putting caustic chemicals or irritants on a horse’s pasterns. The pain causes a horse to lift his feet up higher, exaggerating the gait desired in certain Tennessee Walking Horse classes. In these classes, horses wear chains weighing no more than six ounces around their pasterns. While the chains alone are generally considered benign, even a small chain can increase the effect of soring when it hits a sored pastern with each step. In another form of soring, objects are placed between the shoeing package and the sole of a horse’s hoof so that each time the horse puts weight on the hoof, the horse feels pain and lifts his foot higher to alleviate the feeling. While a single pad placed between a hoof and shoe may have legitimate therapeutic value, the substantial packages used in certain gaited horse show divisions make this form of soring easier to accomplish and hide from inspectors. The full statement from the AVMA and AAEP appears below. 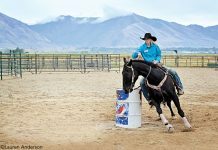 The American Veterinary Medical Association and the American Association of Equine Practitioners support a ban on the use of action devices and performance packages in the training and showing of Tennessee Walking Horses. Action devices used in the training and showing of Tennessee Walking Horses include chains, ankle rings, collars, rollers, and bracelets of wood or aluminum beads. When used in conjunction with chemical irritants on the pastern of the horse’s foot, the motion of the action device creates a painful response, resulting in a more exaggerated gait. Foreign substances are being detected on the pastern area during pre-show inspections at an alarmingly high rate, according to U.S. Department of Agriculture statistics. While there is little scientific evidence to indicate that the use of action devices below a certain weight are detrimental to the health and welfare of the horse, banning action devices from use in the training and showing of Tennessee Walking Horses reduces the motivation to apply a chemical irritant to the pastern. The United States Equestrian Federation (USEF), the national governing body for equestrian sport in the United States, disallows action devices in the show ring for all recognized national breed affiliates. The AVMA and the AAEP commend the USEF for this rule and urge the USDA-APHIS to adopt similar restrictions for Tennessee Walking Horses. Performance packages (also called stacks or pads), made of plastic, leather, wood, rubber and combinations of these materials, are attached below the sole of the horse’s natural hoof and have a metal band that runs around the hoof wall to maintain them in place. Performance packages add weight to the horse’s foot, causing it to strike with more force and at an abnormal angle to the ground. They also facilitate the concealment of items that apply pressure to the sole of the horse’s hoof. Pressure from these hidden items produces pain in the hoof so that the horse lifts its feet faster and higher in an exaggerated gait. Because the inhumane practice of soring Tennessee Walking Horses has continued 40 years after passage of the Horse Protection Act, and because the industry has been unable to make substantial progress in eliminating this abusive practice, the AVMA and the AAEP believe a ban on action devices and performance packages is necessary to protect the health and welfare of the horse. All owner/trainers/riders who have been caught soaring should be ban/kicked out/fine for doing so. 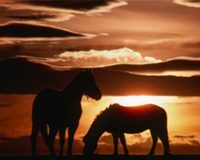 Make the fine so great, that it will not be done again, then use the fine money to help other horses, or help animal abuse. they should not beable to get away with this practice. I think this is a great idea to eliminate soring. The only reason to use all of these elements of performance packages is to exaggerate an unnatural step. While there may be no detriment in using smaller pads there certainly is no benefit either. I hope this ridiculous and cruel practice is discontinued and that horses are allowed to be horses again. I am so glad to hear that a doctors’ organization has finally come out with a recommendation against the practices that go along with soring. But since there are some legitimate therapeutic uses for a single pad, can clear pads be allowed? Also, what about the heavy shoes? Is there a weight limit that’s safe? What about the bands, that look like they constrict the hoof wall, and therefore, circulation? What about extreme heel heights, that appear to shorten the tendons in the back of the leg, and encourage the coffin bone to rotate its toe downward? And it’s true that soring doesn’t work by itself; it only works when combined with enough height and angle of the pad package, plus enough shoe weight, plus (sometimes) action bracelets sliding up and down over the sore spot, to make a significant difference in action. Unwitting audiences started applauding these sored horses many years ago, encouraging judges to give out first places to them, thereby encouraging the proliferation of more sored horses and fewer naturally talented bloodstock, etc. Now you can hardly find a good-looking, athletic, naturally gaited TWH or Racking Horse out there. The public has to voice their opinion and let breeders, trainers, and owners know that they don’t approve of treating horses this way and won’t support one that has been subjected to this treatment. Peer pressure has always worked better than any number of laws in any society. If banning all devices of any kind, plus multiple pads, plus bands, plus heel heights over a certain amount, plus instituting soring chemical testing, is what it takes to make the suffering finally stop, then I’m all for it. Forty years is 40 years too long to wait. It’s destroyed this sweet breed’s popularity, and their owner’s reputation, so much, that all I had to say to a non-horse person to get accused of soring my horse, was that I was a TWH owner. Looking forward to a better day for all abused horses, Mary in SC. I’m so glad that this being stop. No horse should have to go through that pain. I guess people will do anything for a win. I’m so pleased to read this statement. It is high time these bizarre, painful and un natural practices were ended altogether. Stacks and soring appear inextricably linked and soring has been illegal for decades. Why do humans seem intent on turning horses into something so ugly and inelegant? Tennesse Walkers are prized for their endurance, what endurance could a pained, stacked horse possibly have? The cost to thousand/millions of horses is and has been a disgrace. I wholeheartedly second a return to appreciation of the natural beauty of horses and horses produced in a slow, ethical way to perform the gaits we desire.